You Make Jewelry? Fix this! If you make jewelry, you will be asked to do a repair. It happens. If it hasn’t happened to you yet, rest assured that it will. Sometimes it’s as simple as restringing an inexpensive bracelet on elastic. Sometimes it’s in-depth, a multi-strand necklace or a woven project that you’re going to need to dedicate hours of work to. Where do you draw the line on your willingness and your fee for this kind of work? As a business, we do repairs regularly. We get these same requests. But as a business, people come to us expecting to have to pay for the service. If you’re a co-worker or a fellow member of the congregation, you might not be expected to do this free of charge but you’re probably going to do it for a song – cost of supplies, if that. Am I right? You don’t have to answer. I know. We get some of these passed along to us as well. The frustrated beader who has been asked to do a repair that they can’t do or just don’t have the time for. The repair project has been sitting in their studio space for weeks or months. The longer it sits, the more it weighs on them. They got into beading for fun and, no, repairs are not fun. Repairs can be surprisingly stressful. It’s almost never as easy as you thought it was going to be. You never have the exact replacement for that one bead which was lost in the break. You swear you can tell the difference between those two nearly-identical shades of cream. As a jewelry maker, you have to make the decision for yourself if doing repairs is worthwhile. It’s nice to be able to do something for friends, especially if it means saving a much-worn piece of jewelry from the trash bin. But is it worth the time and frustration? For us it depends on the project, not the person. We don’t do beadweaving repairs. They just take too much time. The kind of beadweaving repair you’re likely to be faced with is a netting bracelet made with Czech seed beads and monofilament. It was inexpensive but it’s quite pretty. The owner imagines you’ll be able to fix it for less than the price of the piece. After all, it’s only a little loose thread and a few missing beads. The reality of it is that even a quick patch job is going to take you at least an hour or two, not including the time it will take to hunt down the right bead. And because the bracelet is made of monofilament, it will inevitably break again. The best thing to do would be re-weave the whole thing, an investment of long hours of work that your friend is not going to want to pay for. How about this one: your co-worker broke a necklace she bought some years ago. She was at a restaurant but she is positive she found all the beads. (Spoiler: she didn’t. They never do.) 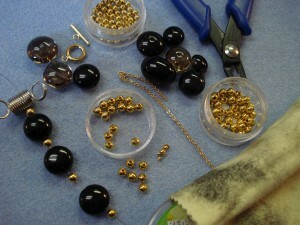 Upon laying it all out on your design board you find that there are indeed a few beads missing. You play around with the pattern for a while moving beads from the back of the necklace to hide the replacements which are a few millimeters smaller, not an exact match. 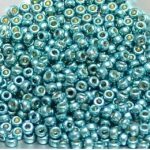 Once you have it disassembled you notice that the plating on the spacer beads is looking a little worse for wear, so you decide to replace those as well – you have some in your stash. The clasp looks a little dingy in comparison, so you polish it up. Now it’s finally time to restring. On beading wire this time, not the cotton cord it had been on originally. Was that one worth it? Chances are that you’re going to say yes when someone asks you to fix a broken piece of jewelry. And you might very well come to regret that decision. It might sit on your desk for the better part of a year before you can bring yourself to actually fix it. You might curse your way through the whole repair, vowing never to do another one again. Repair work probably isn’t going to be worth it for you monetarily. It’s probably going to be frustrating work that you procrastinate over. But having done many a repair here at the shop, I can tell you that there are some payoffs – even if you can’t use them to pay for more beads. You’re going to make the owner of the owner of the jewelry happy, for one. You’re going to take something that they were ready to throw in the trash and perform magic on it. You’re also going to learn some problem-solving skills that you didn’t even know you needed. The impossible repair becomes an exercise in creative thinking once you’ve committed yourself to it. You will learn how to turn fourteen inches of broken necklace into a brand new eighteen inch necklace, better than the day it was purchased. You’re going to fix that broken latch in under a minute. You’re going to save that sentimental old piece of costume jewelry. What a miracle worker you are!